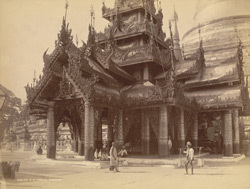 Photograph of a shrine at the Shwe Dagon Paya (Pagoda) in Rangoon (Yangon), Burma (Myanmar), taken by Philip Adolphe Klier in the 1890s. This is a general view of the shrine, one of many on the platform of the Shwe Dagon, Burma’s most revered Buddhist temple. The building has a tiered spire known as a pyat-that, an architectural element demarcating sacred royal or religious space. It is decorated with flamboyant carved wooden eaves, intricate spandrels, and mirrored glass mosaic on the pillars. These are important ornamental elements used on Burmese temples to symbolise the heavenly realm and to create an impression of luxury and magnificence.